For more than a decade, the Big Shoulders Fund Fellowship Program has helped to flip the story of enrollment at our schools. With aggregate enrollment across our elementary schools largely steady or increasing, this narrative runs counter to national trends of decline. As a key component of the Big Shoulders Fund School Marketing Team, the Fellowship Program brings marketing resources directly to schools, helping them with strategy and staffing during the critical summer months when schools recruit and onboard new students. In collaboration with school administrators, the Fellowship Program has evolved to become a leading form of support for Big Shoulders Fund schools’ marketing efforts. In 2015, the Fellowship converted to a paid internship program. It attracts top candidates to support the Big Shoulders Fund schools, recruiting college students and recent graduates. Thus far, applicants have come from 25 plus universities. Skillsets range in videography, graphic design, web design, communications, and community organizing. In recent years, we have seen an increase in the number of applicants who are graduates of Big Shoulders Fund schools, which really speaks volumes of the role a values-based education plays in the lives of our students and how they decide to give back to their communities. One-third of the Fellows from the class of 2018 attended Big Shoulders Fund schools or were Big Shoulders Fund scholars and fifty percent represent minorities. Since 2015, eight Fellows have joined the Big Shoulders Fund staff or continued their work with our schools as Marketing Directors or consultants. The numbers speak for themselves on the success of this program, making it clear that this initiative provides schools with the support needed to improve enrollment. Fellows play an active role in schools’ marketing efforts working hand in hand with school administration and parents in an effort to increase overall visibility through community engagement and digital and print marketing. They gain hands on experience in their field while working directly in our schools, instead of in our Big Shoulders office, to maximize their impact. They also get the opportunity to collaborate with Big Shoulders Fund staff and expand their knowledge of the nonprofit world. 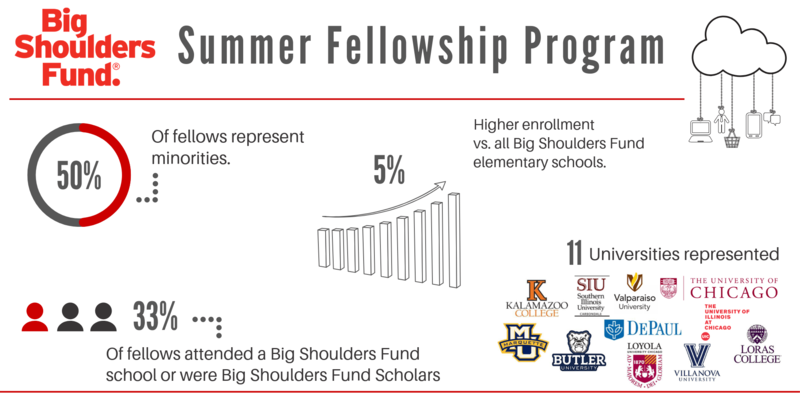 In the summer of 2018, Big Shoulders Fund introduced the Opportunity Scholarship. This scholarship was created to help more families have access to a quality, values-based education. It ultimately helped recruit more than 600 new students into Big Shoulders Fund schools. To help schools promote this new resource, the school marketing team enlisted the help of the Fellows. Fellows canvassed, held open houses, attended fairs and festivals, and promoted online via various platforms to help maximize exposure of this new opportunity. Big Shoulders Fund schools saw a tremendous response from these efforts. In fact, in 2018, schools who had support from Fellows during the summer had a five percent higher enrollment at the end of the program versus all Big Shoulders Fund elementary schools. With the help of these young professionals, not only are we helping these community institutions to grow and flourish, we are creating the next generation of civic leaders and school administrators that will help improve the state of our education system thus strengthening our communities and City as a whole. The Big Shoulders Fund Fellowship Program is currently recruiting for the summer class of 2019. Click here to view the internship description. If you want more information or have questions about the program, please contact Elizabeth Tracy (312.374.5671).